Grand Rapids Catholic Central’s Ryheem Stokes entered the season as our No. 15 ranked senior, and looked every bit of it on both sides of the ball in the Cougars’ head-turning 33-14 win at East Grand Rapids. Stokes made two interceptions, blocked a punt and ran for a 53-yard TD. Our No. 7 2014 prospect, Cadillac junior QB/DB Jalen Brooks, has one more season to run behind the Great Wall of the North. With Ferris State there to scout him, he did so against Lansing Eastern to the result of 200 total yards with three rushing TDs and one passing. The Vikings won 33-20. The Quakers have a tough running QB themselves, senior Santiago Mendez. A week before, Brooks and Cadillac scrimmaged at Montague and their similarly athletic senior QB Brandon Moore. The former receiver, our No. 3 2013 prospect, had 187 total yards with two TDs rushing and one throwing. 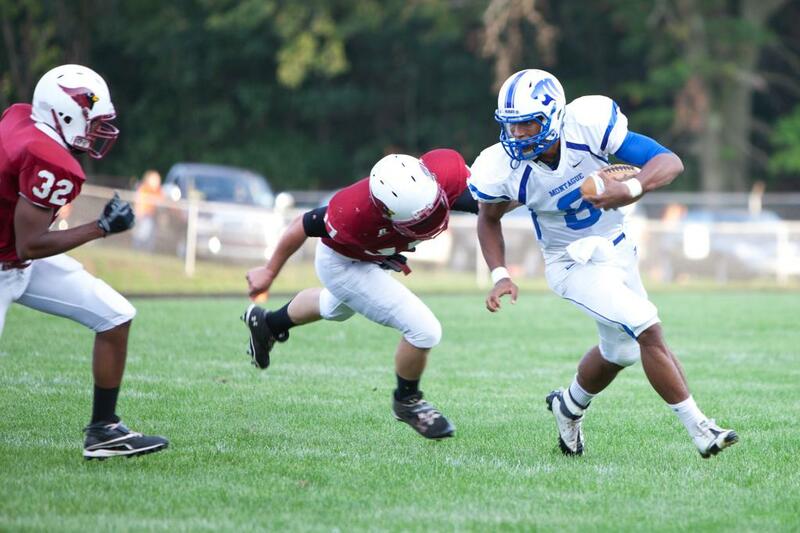 Montague rolled Muskegon Orchard View 49-0. Paw Paw beat up South Haven 62-21. Senior QB Justin McCauley credited Paw Paw’s offensive line for the dominance, as they racked up 629 yards. Grayling junior QB Jake Swander threw for 285 yards and three TDs. The Vikings beat Roscommon 28-20. Baldwin senior Andon Ware ran up 214 yards and three TDs in a 37-26 win against Hale. Only a sophomore, Ravenna’s Gabe Zimmer rushed for 198 yards and three TDs in a 28-21 defeat of Kent City. Another 10th-grade back, Allendale’s Ethan Hovingh had 251 yards and 2TDs in a 14-7 win against Hudsonville Unity Christian.